How to Get Good Grades in School, College or University? Grades are very essential for measuring the performance of school or college. Every student wants good grades in high school, college or university. 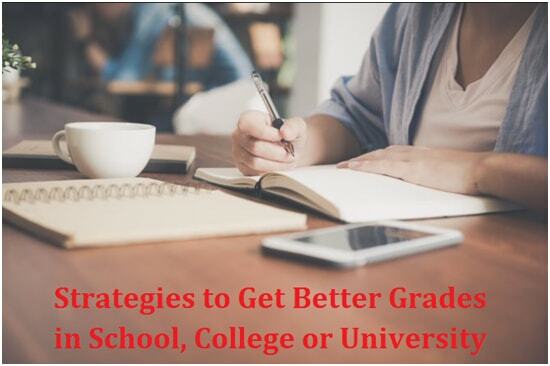 It is not difficult task if you make some strategies to get good grades. Here are some tips given which help you to get good grades in school or college as prescribed below. First of all you should make your study schedule for how many hours you can study and how much time you can devote for the study other than the school hours. Always keep a planner in you backpack or calendar at home in your room. Always record of every test schedule, assignment submission dates, holidays, etc. Organize the schedule how much work should be done every day as per your ability to do and always check how much you completed and what portion is still rest. Devote some times for playing games from the busy schedule as you can get refresh and give your best to your work. Make sure you follow your schedule which you have planned for your study. You should also plan your weekend and devote some times for study on weekends and after that you can go out and have fun. Attend you school and concentrate on the topics which is taught by teachers and if any doubt regarding some concept ask teacher about it. Don’t feel embarrass to ask something. Participate in extracurricular activities in the school. Complete you homework daily. You should finish assignments or project works before the due dates. Always focus on the activity whatever you doing at that time. Never watch T.V. at the time of your study. Always study in comfortable and at quite place or in the library as you can do your best to the study. Get inspiration by reading motivational and inspirational books or story or from successful students and ask them about their strategies for study and follow it. You eating schedule is very essential part of the study. You should always maintain your breakfast, lunch and dinner schedule. Create your own study guides which help you to make study very easily at the time of the examination. You need to only review it at the time of test as you can cover all the topics. Give more time to the hard subject. You should make preparation for the test with your friends or classmates through group discussion. It will become very motivational for you and you can study effectively, quickly and creatively. Devote some time for Yoga and Meditation as you can feel relax. It will improve your memory and positive energy will be produced in your body. You should get a good sleep at night. You need sleep of at least 7 to 8 hours a day. By using these tips you definitely get better grades. Be a good student and follow your teacher’s instruction and participate in class which helps you to achieve your goals. How to get better grades in college or university? By using these tips you definitely get better grades. It is not difficult task if you make some strategies to get good grades. Here are some tips given which help you to get good grades in school or college as prescribed below. Next Post:How to Answer Questions at an Interview?